There are many plants that benefit from fire. Typical examples are those that despite they may be killed by fire, the germination of their seeds is stimulated by the fire (either by the heat or by the smoke; [1,2]), and thus they recruit very well (high offspring abundance) and often increase there population size postfire. Species with fire-stimulated flowering [3,4] also benefit from fire. In a recent paper  we propose that there may be another mechanisms by which fire may benefit plants: fire may remove seed predators, and thus create a window of opportunity for reproduction under a lower predation pressure (predator release hypothesis). This is specially applicable to specialist plant-insect interactions. We documented two cases: in Ulex parviflorus, a plant species with fire-stimulated germination [1,2], fire eliminated there specialist seed predator weevil (Exapion fasciolatum, Apioninae, Brentidae) and thus increased the available seed number for germination. Similarly, in Asphodelus ramosus, a fire-stimulated flowering species , fire reduced the specialist herbivore and seed predator (Horistus orientalis, Miridae, Hemiptera) and increased their fruit production. Thus, fire, by disrupting the antagonistic interactions, benefit plants; the temporal window of this predator release is likely to depend on fire size. For more information see reference . 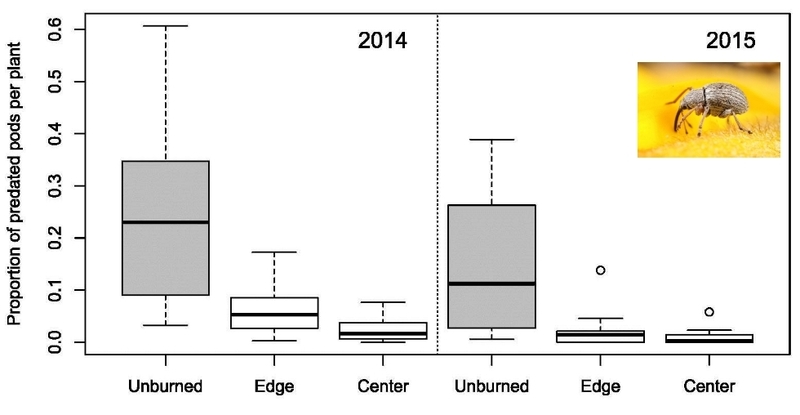 Figure: Proportion of predated fruits of Ulex parviflorus in unburned sites (grey boxes) and at the edge and center of a recently burned area (white boxes), 2 and 3 years postfire. Data from two large wildfires in Valencia (2012) ; Edge and Center of the burned area refer to <1 km and >1.5 km from the fire perimeter, respectively. Photo of the seed predator (Exapion) from BioLib.cz. García Y., Castellanos M.C. & Pausas J.G. 2016. Fires can benefit plants by disrupting antagonistic interactions. Oecologia 182: 1165–1173. [doi | pdf] <- New!! I’ve been a long-time reader, and this is my first post. First, I want to say that I enjoy your blog and work, so thank you for sharing it! Second, I want to comment and say that I thoroughly enjoy, simple, informative, elegant studies, such as this one. I think that the interaction between disturbance and species’ interactions is a wide-open field with many unanswered questions (with the exception of competitive interactions, which has received a great deal of attention). I am curious to know how these discrete patterns change over time and how they would change if they were measured continuously. And another question that crossed my mind is the differences in plant defenses at these same areas. I imagine that they would be very different in some plants and could have some effect on the herbivores. Last, I wanted to thank you for at least nodding to the interaction between disturbance and mutualism. You write that mutualism is disrupted, but I wonder in what ways mutualism is enhanced. For instance, many plants that have seed-dispersal mutualisms can better colonize habitats/microsites than abiotically-dispersed plants. For those plants, then, is mutualism strengthened through disturbance? What about (relatively) specialized pollinators? It seems like plants with specialized pollinators might even have the opposite pattern than the antagonists. Anyhow, those are just some thoughts. Thank you for the post and paper. Many thanks for your comments. We are currently working on how these interactions are changing over time (i.e, with time since fire). Also, we are planning to study the role of fire in some pollination systems next year, and as you said, the expectation is the opposite pattern. – Cheers.